On a mini getaway in New Hampshire and in between a trip to the roadside market and back into the hotel for dinner, we found a young man to teach us how to throw an ax. I thought I'd be decent at the sport because of my previous experience in discus and shotput throwing, but I barely hit the target. And it was okay. I tried something new and I can say that I stood on a mountain top and threw an ax. A freakin' ax. Wow, I didn't even know this existed. Do people get injured often? 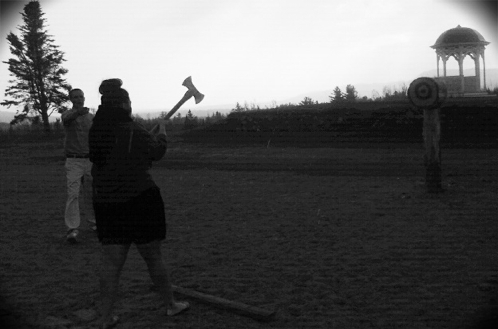 I'm seriously impressed that you even managed to hit the target, even if it was just barely, axes are heavy! lol that's freaking awesome. I wanna throw one too! !